The U.S.S. Galilea is a Nova-class Short-Range Planetary Research Vessel, designed by Starfleet as a workhorse in its Geological and Xenobiological divisions. It is smaller than the average Federation ship, spanning only eight decks, with a crew compliment of 80. The most infamous Nova-class vessel was the U.S.S. Equinox, flung clear across the galaxy into the Delta Quadrant, where its crew survived for five years – until discovery by the U.S.S. Voyager – by ruthless determination. Its significantly-diminished surviving crew and its logs were recovered by Voyager, and submitted to Starfleet Command upon its return to Earth in 2378. 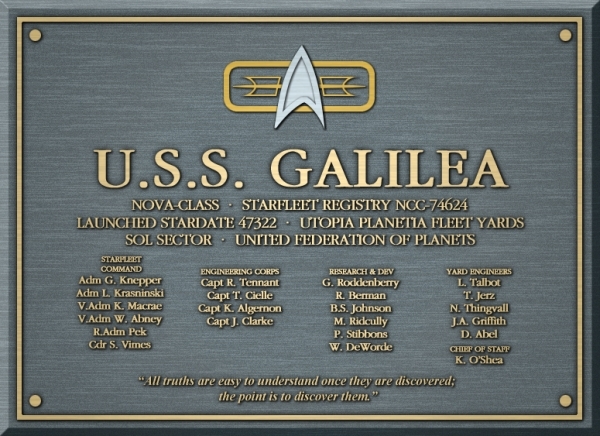 The Galilea was commissioned in 2370 in the Utopia Planetia Shipyards over Mars, under the command of Captain Sinjin Harper, with Commander Surak as his first officer. Captain Harper was transferred to the U.S.S. Kusanagi after the Dominion War, with Surak succeeding him as Captain. His first tour of duty was in 2380, bringing him to Bajor for the selection of his first officer. Commander S. Vimes? Really? Really, Kevin?